There are plenty of great facts to learn about the Cheetah. By doing so you may find a new appreciation and even be in awe of this amazing creature. The Cheetah is a wonderful cat. It has amazing speed and is categorized as the fastest animal on land in the entire world. It can reach speeds of up to 75 miles per hour. They can go from 0 to 64 miles per hour in about 3 seconds. The spotted pattern of the Cheetah is very unique for each of them. This is a way for them to be easily identified during research. It is believed that no two Cheetahs offer the same pattern. 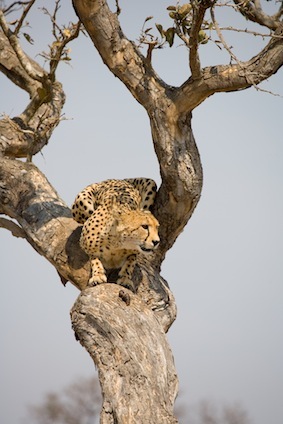 The Cheetah relies upon its spots to help it to be well hidden in the wild. Then it has the element of surprise when it is ready to attack its prey. The tail of a Cheetah can measure 32-33 inches in length. The Cheetah is able to purr like other big cats. However, it doesn’t have the ability to roar. The Cheetah is often mistaken for the Leopard in the wild. As a result there is a great deal of conflicting information about where they live and the number of them that remain in the wild. What is often referred to as the King Cheetah isn’t a separate species. Instead it is one that has a genetic mutation that affects the look of the spots on the fur. The Cheetah is the one of all the felines that is the least able to adapt successfully to changes in its environment. Both African and Asia are home to the Cheetah. They were originally only located in Africa. However, it is believed that after the Miocene epoch migrated into Asia. A very limited number of them are also found in Iran but few people are aware of that fact. In the past high fluent individuals of Asia and Africa trained Cheetahs from a young age. They used them to track down and bring back antelope for them. It is possible for the cubs that a female Cheetah has in a single litter to have different fathers. The baby Cheetahs are born with spots on them. This is different from other felines where the spots will develop as they get older. As many as 90% of the young Cheetahs will be killed by predators during the first few years of life. The males are more social when it comes to the Cheetah than the females. Other than mating or when they care for young offspring the females prefer to be left alone. Cheetahs are classified as carnivores which means that they are meat eaters. They are active both at night and during the day. They hunt early in the morning, rest during the heat of the day, and then hunt again in the early evening hours. The Cheetah will abandon the source of food it has killed if other predators that consume meat come into the area. They don’t fight for it so when they do have food they will consume it as fast as they can. The Cheetah is far less aggressive than other types of felines. It is possible for them to be tamed. The selling of Cheetah cubs for pets continues to occur even though it is illegal to do so in most parts of the world. The Egyptians often kept the Cheetah as a pet and would walk them on leashes. There are early writings and pictures from that time that depict this occurring.